Providing the right information to your website visitors, instead of useless fluff, is important to us. We understand technical jargon and geek-out creating your website! We develop your website so it’s relevant to your specific audience(s). Check out some of the websites we’ve created – see below. As with most of our recent web projects, Knepper Press’ employees can update their own website using a CMS and simple web interface, no programming experience required. 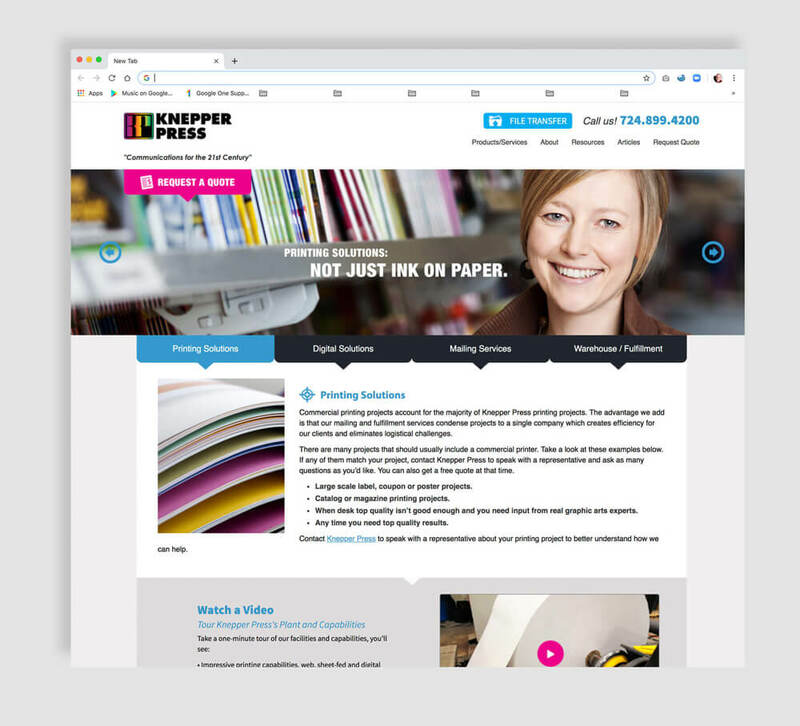 The website design includes dozens of pages describing Knepper Press’ printing services, links to their online file uploads, and several forms for visitors to upload specifications and request printing quotes. The site is bright, colorful, and eye-catching. This responsive website design features many photo galleries of industrial projects. The photo galleries have unique behaviors – the images softly build into a variable grid design. Once clicked, images are opened in a lightbox with a greyed-out background. Forward and backward arrows allow visitors to select through the images. Another nice feature of the site is the “one-click contact” form. Select the “+” icon and a form slides into place. Visitors can easily fill out the form without having to leave the page. This feature saves space and keeps the form neatly hidden until a visitor chooses it. This mobile-ready website has an incredible mapping feature. For novice users, we programmed WordPress so that a user can add locations to a Google map, include text details about the road project and an image of the construction site. Visitors to the site can simply click on the map to see the details. Over 150 projects are mapped and described on the site. MLP Steel hired us to update their old-looking website. We changed the entire look and added mobile functionality via Bootstrap. The site was created as a custom WordPress theme and includes all of the easy-to-edit features of WordPress. The Houston Starr industrial web design was developed so that it can be updated by novice users. The web pages show products organized by category so web visitors can easily understand how the site is organized. A content management WordPress site, Abmech Inc’s website development includes customer surveys. Direct Axis designed the site and the logo. WC Weil Company hired us to create a site that would increase their professionalism and convince web visitors that the company is a superior provider of municipal water and waste water systems. Several photo galleries and numerous case studies are accessible through an easy-to-use interface. The site is a content management system, so our client can update their own web pages with text and images. Lumber mills are not the most photogenic places, but the product they produce is beautiful. We focused on images from the source of the product – trees and forests – and combined them with images of the final product to create a quality brand for 4 lumber mills.